Sharks and Rays in North Carolina’s Natural Laboratory – Ya Like Dags? I got a nice pre-Thanksgiving surprise when the latest paper based on my dissertation research officially went live at the Bulletin of Marine Science. This research was presented at the amazing Fish at Night Symposium and will be part of the upcoming special issue focused on that meeting, but for now is available totally open-access as a Fast Track article. The paper is the culmination of two years of running an estuarine shark survey in Back and Core Sounds in the Crystal Coast region of North Carolina, a project that would prove to be one of my most high-profile. The Back/Core Sound system is an incredible place to work thanks to the huge variety of marine and estuarine habitats and its extreme convenience to the towns of Beaufort and Morehead City (which in and of themselves are worth a visit). I’m far from the only person who thinks so. UNC Chapel Hill, NC State, and Duke University all have marine labs based in the area, and Carteret Community College also gets into the mix through their aquaculture program. The Rachel Carson National Estuarine Research Reserve is part of this ecosystem, as is one of the longest-running NOAA labs. All of these institutions have used the natural laboratory of Back/Core Sound in a wide variety of research efforts. However, at the time I was getting my survey rolling there hadn’t been any research focused on the estuary’s elasmobranchs. I feel very privileged to have helped change that. Though the original project also included some acoustic tagging and tracking, this paper focuses on the results of the survey itself (the acoustic tagging part of the project will be it’s own separate paper, which is in the works). The survey took place from March-November in 2014 and 2015 and was a truly multi-gear effort, with sharks caught by gillnet, longline, and rod and reel during both years and a drumline (graciously loaned by the Read lab at DUML) added in for the second summer. Using a variety of gear allows you to have a better chance of sampling every available shark species: if a shark isn’t hungry for what the longline is baited with, you could still get it with the gillnet. We also tried to test out hypotheses about sharks being more common during certain times of the day by conducting the survey between noon and midnight, which allowed us to cover sunset and nighttime hours not usually covered by shark surveys. The end goal was to provide baseline data on the sharks and rays of the estuary, which could provide a jumping-off point for future elasmobranch work and provide potential explanations for some of the behaviors seen in other local species. 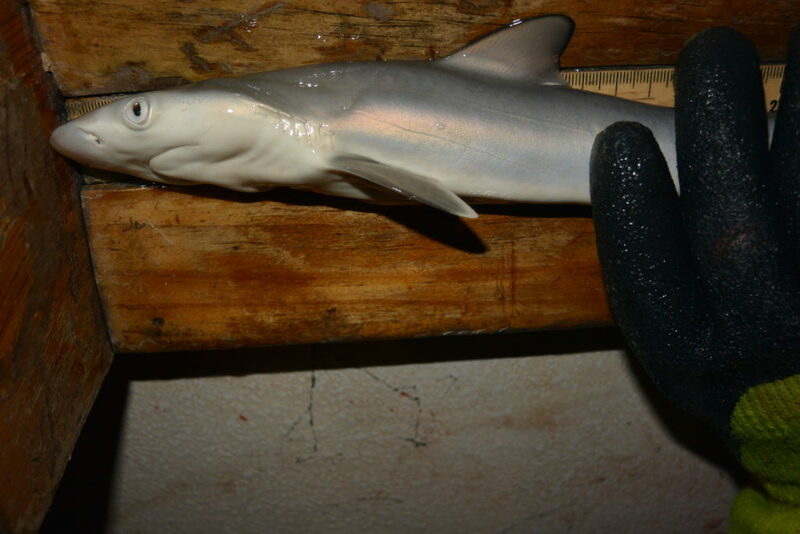 A literally newborn Atlantic sharpnose shark (Rhizoprionodon terraenovae), which turned out to be one of the most common sharks in the estuary. Photo by Cecilia Krahforst. Ultimately we found 160 elasmobranchs in total, with 12 species represented (and an additional two requiem sharks that busted out of the gear before we could get a positive ID). These ranged in size from adorable baby Atlantic sharpnose sharks and bullnose rays in the 20-30-cm range to a massive 2.5-m bull shark (that’s 8.25 feet long for those of you who don’t think in metric). Sharpnose sharks, southern stingrays, and interestingly, spiny dogfish proved to be the most common elasmobranchs in the system, though the dogfish had cleared out of the area by mid-June (which is considerably later than they’re supposed to hang out in North Carolina waters). Most of the species were habitat generalists with strongly overlapping preferences in depth, temperature, salinity, dissolved oxygen, inlet distance, proximity to seagrass beds, and time of capture, but catching most species in the same set as others (termed as spatial overlap in the paper) was actually pretty uncommon. This suggests that there may be behavioral avoidance occurring between species that otherwise have pretty much the same taste in habitat. The most interesting results involved a lesser-known species, the blacknose shark, a relatively small species that maxes out at lengths around 1.2 meters/4 feet. These sharks were the most feisty elasmos in the survey and I consider it a minor miracle I made it through two summers without getting bitten by one. While we didn’t see a clear relationship with time of day for the other species, blacknose sharks were definitely more common at night. The majority of them were also caught in an area I came to call “blacknose alley” near Beaufort Inlet, and they generally didn’t seem to stray much farther from the inlets. Blacknose sharks also showed the clearest evidence for resource partitioning, or splitting the available habitat with another species, with juvenile blacktip sharks, which were much more likely to travel farther up into Core Sound. Essentially both blacknose and blacktip sharks had staked out their own “turf” and were never caught in the same sets. Blacktip and sharpnose sharks had no problem occurring in the same areas, which didn’t always work out so well for the sharpnose sharks. Photo by Cecilia Krahforst. It’s pretty cool to know which sharks are in the area, especially within an estuary where they aren’t typically well-documented, but what’s the importance of all this baseline data? Having an idea of when and where these species show up can be very helpful for fishery management and identification of important habitats. 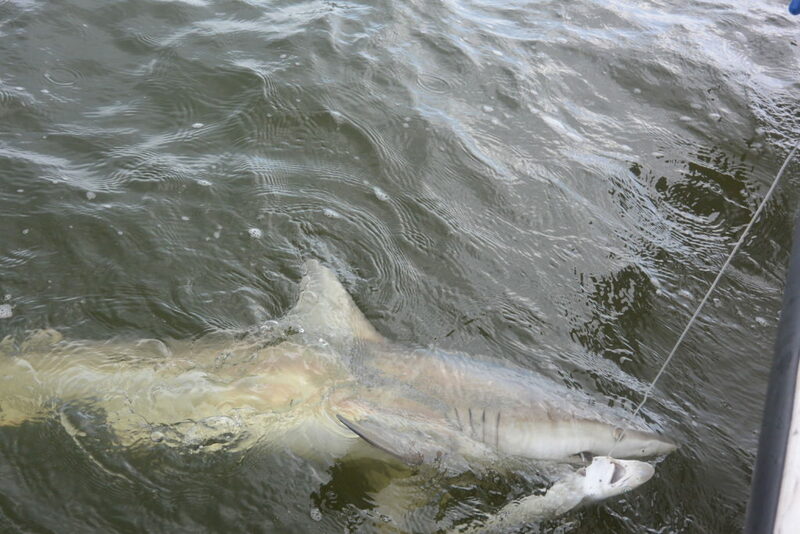 Also, a bit of information as basic as “blacknose sharks are more common in the estuary at night” can be an important puzzle piece in figuring out things like predation risk for their preferred prey (which includes such well-studied North Carolina species as Atlantic croaker and weakfish). It also gives any future researchers looking at sharks in North Carolina’s estuaries a place to start. This project (and the paper) would not have been possible without a literal boatload of volunteer helpers. I tried to count how many volunteers helped out and it’s over 40 individuals. The volunteer list includes fellow ECU grad students, researchers from other institutions, and interested members of the general public. The survey’s second year was also funded with help from a North Carolina Sea Grant minigrant. More shark projects are already happening in Back Sound, including one tracking obonnethead sharks with both acoustic telemetry and drones. So next time you get a chance to take a dip or a paddle near Beaufort or Morehead City, spare a thought for the at least 12 species of sharks and rays circling around under your feet, where they’ve probably been every time you’ve been out on the water.